Sakura Watch, April 16, 2012 - Sakura // Cherry Blossoms stood up well against strong winds and rain today in High Park. The excellent summer-like weather was only the beginning of a great evening - upon arriving at the park I was pleasantly surprised to see that most of the blossoms are still intact! This means the Sakura Hanami can continue for a few more days at least. However, if you are planning on waiting until this weekend to make your trip to the park, you may be disappointed as by then I predict the blossoms will lose about 50% of their bloom (even more if we get any rainstorms and strong winds by then) - see more about this below. But first let me share some photos of the evening, especially the beautiful display of the butterflies enjoying the cherry blossoms by the children's playground and Grenadier Pond - there must have been dozens, and dozens were flying around and were so lovely to see! Add to that the gorgeous hot temperatures and golden sunset, and it's just another reminder of why I, like so many of you visiting this site, love experiencing the park this time of year. Sakura Watch Update This past weekend was the peak bloom - this means we saw 100% Sakura // Cherry Blossoms in bloom - and last couple days the petals have been beginning to fall. So as of today, the homepage updates for the Sakura Watch will start to show the percentage of remaining blossoms per area throughout the park. Will the Sakura // Cherry Blossoms last until the April 20-22 weekend? Weather always plays a crucial role in how long the Sakura // Cherry Blossoms last. 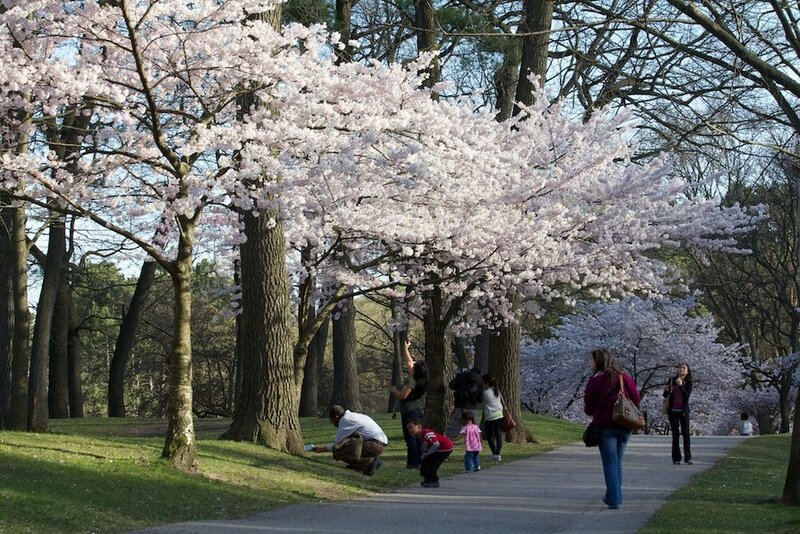 The trees will pass one (1) week of peak bloom which usually is when blossoms petals begin to fall. So keep in mind that it might be possible to see the Sakura still this coming weekend, it most likely won't be as bright or as full as we they are right now. Falling blossom petals have their own beauty as well, and I'm hoping I can catch it on video this year. I can best explain it looks like a delicate, slow snowfall and for me is even more reason to enjoy the Sakura // Cherry Blossoms and remind us how much natural beauty we are so lucky to have in this city.